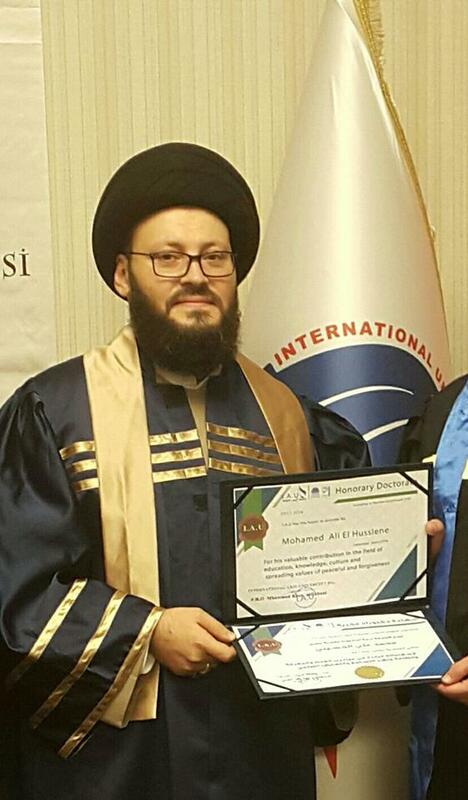 • الموضوع : Sayed Mohamad Ali El Husseini gets PhD. 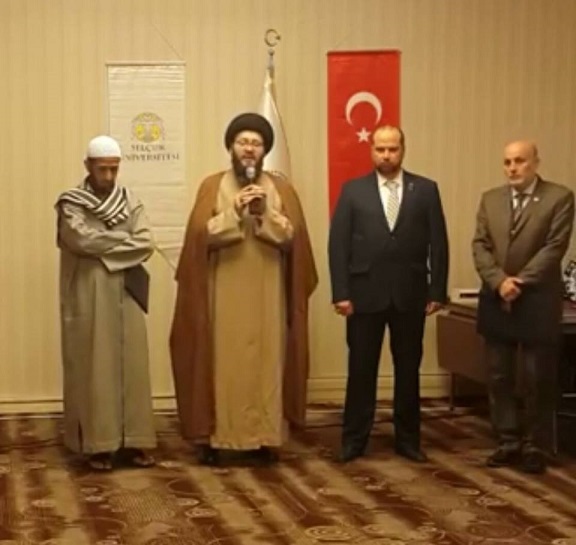 in Istanbul appreciate for his contributions scientific and activity in the dissemination of a culture of tolerance and peaceful coexistence and religious pluralism . 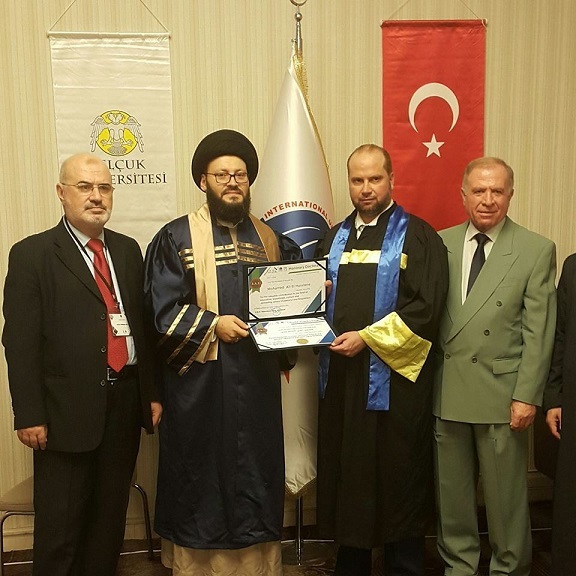 In line with the policy of the University of Erice international adoption of the Federation International Universities - Turkey in the service and encourage researchers and thinkers and workers in the field of scientific research and humanitarian issues, on the basis of the rules of procedure of the League, the Committee granted the specialized higher which Sayed Mohamad Ali El Husseini in academic celebration rally honorary doctorate professor for his outstanding contributions in the fields of science and knowledge and activity in the service of scientific research in the promotion of tolerance and the culture of peaceful coexistence. In a special ceremony marked by words inspired by the occasion. The Committee commended the donor countries actively the contribution of Sayed Mohamad Ali El Husseini intellectual and cultural in the country and the Arab world in the promotion of a culture of tolerance between different cultures and civilizations, and its role in creating social peace through his thesis calling for respect for the religious pluralism OIC - Christian - Jewish, tireless work for the administration of this multilingualism in the intellectual framework Apostle, away from all forms of violence and moral and material support. The Committee noted the academy that intellectual activity to Sayed El Husseini Arab contributed to a great extent in quelling the Sunni sedition Shiite-which worked some regional constituencies in exacerbating and succeeded in the interpretation of the political causes of the fabricated purely ordered his behind some local conflicts in a number of countries in the region, confirming that it is not to the spirit of the religions nothing. 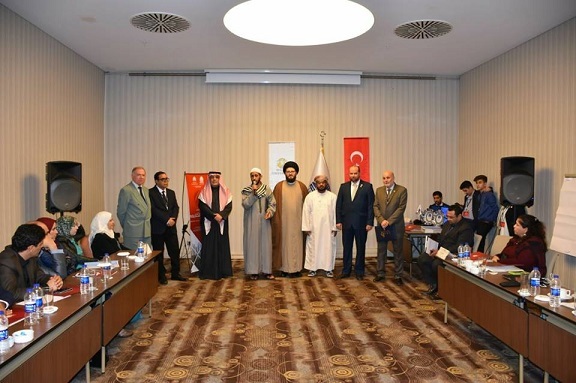 The Committee also welcomed the great role played by Sayed El Husseini at the international level in the provision of Islam to moderate open to other religions, which pulled the rug from under the feet of the extremists who worked on the hostility of the other, in an Arab country, to sensitize similar reactions in various parts of the world. • Dr Mohamad Ali El Husseini at the Abu Dhabi Peace Reinforcement Forum:"Alliance of Foudoul " is a historic example of the establishment of humanitarian cooperation and the protection of civil peace.